With our modern treatment options, you can address all kinds of dental options and create your healthiest, most beautiful smile. Our dental experts, Dr. Dankworth and Dr. Corrigan-Dankworth, are proficient in a variety of dental fields, including restorative dentistry. 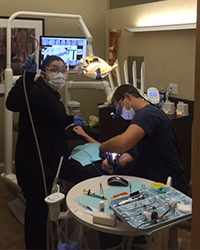 They provide the best materials and techniques to their patients to deliver incredible new smiles. Dental crowns are tooth-shaped caps that fortify a broken tooth, cracked tooth, or a decayed tooth. Dental crowns restore form and function while also enhancing aesthetics. We will design your dental crown based on your smile. Once your crown has been crafted by our lab, we will place the permanent crown over the broken tooth or cracked tooth. Dental bridges are a series of dental crowns that can replace missing teeth along the gumline. Dental bridges are supported on either side by crowns placed over adjacent teeth. Beautiful replacement teeth fill in the gap. Missing teeth is a common problem that may affect more patients than you think. Aging, trauma, and gum disease all lead to tooth loss. Fortunately, we use innovative tooth replacement methods at Oceanside Dental Excellence so that no one will know the difference between your replacements and your true teeth. Dental implants are the closest thing to natural teeth. First, we replace missing tooth roots with titanium rods placed into the jawbone. Then, we top the dental implant with a beautiful crown, bridge, or denture. We are proud to announce that we provide every step of the dental implants process right here in our office instead of sending you to a specialist. Dentures are another way to mitigate missing teeth and restore your confidence in your smile. We provide traditional dentures or dentures anchored by dental implants. You don’t have to drive from dentist to dentist for varying smile needs. We can help you and your loved ones with all types of dental care right here at Oceanside Dental Excellence. If you have a broken tooth or cracked tooth, don’t delay needed dental care. For high-quality dentistry, request an appointment today.